LYNDHURST, NJ – The regular schedule winds up this weekend with the postseason tournament beginning on Friday in Albany. Siena is in the driver’s seat as regular season champion, top tournament seed and host of the get together in New York’s capitol city. The Saints’ BracketBuster setback at Butler all but insures Siena will have to cut down the nets at the Times Union Center to get to the Big Dance. Something they are in very favorable position to do. Player of the Week: Ryan Thompson (G/F), Rider – Averaged 29.5 PPG, 4.5 rebounds and assists in two games. Scored 21 in a win at St.Peter’s and followed up with a carrer-high 38 in an OT loss at Hofstra. Rookie of the Week: Colin Nickerson (G), Fairfield – Averaged 16.5 PPG and shot 65% from the field in two games for the Stags. Set a career high of 13 against Manhattan than surpassed it with 20 points at Vermont. 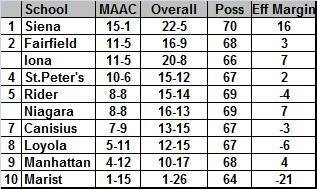 Iona’s nine conference wins is the fifth highest total since the Gaels started MAAC play in 1981-82. Derek Needham set the freshman scoring record at Fairfield. Needham broke the mark of 427 set by Fordham assistant Joe DeSantis in 1976. Frank Turner of Canisius enters the final weekend with 593 career assists leaving him just shy of being the seventh MAAC player to hand out 700 assists. Turner tied the school record with 121 games played, a mark he is set to eclipse this weekend. Ryan Thompson, with 1,809 career points, is fourth on Rider’s all time scoring list. Older brother Jason (‘08) is in third at 2.040 points. Speaking of Rider, juniors Mike Ringgold, Justin Robinson and Jharmar Youngblood all joined the school’s 900-point club recently. St. Peter’s’ fifteen victories is the most in four years. Ten MAAC wins is the best showing since the 2004-05 campaign. On Senior Day at Siena this Sunday, the school will honor the most successful senior class in program history. Canisius – Improved to 4-1 all time in BracketBusters with a win over James Madison. The victory gave Canisius its 13th win, the most in Tom Parrotta’s four year tenure. Win also gave the Golden Griffins their first winning season at home in five years. Frank Turner had an excellent 16 point, 13 assist game in his final Koessler Athletic Center appearance. Junior forward Greg Logins added 15 points, 8 rebounds against JMU. Another junior, Tomas Vazquez-Simmons, had 4 blocks against the Dukes , giving him 199 rejections for his career. Fairfield – Ended the regular season with an 8-7 road record including 6-3 in MAAC play. Derek Needham and Anthony Johnson continued their fine play for the Stags. Fairfield did get an additional lift from freshman Colin Nickerson, with a good scoring week including a 20-point outing at Vermont. Stags wind up the regular season at home against Iona and Niagara. Iona – The 69-53 BracketBuster win over William & Mary was the Gaels’ 20th of the season. It was the first 20-win season in four years and 14th in program history. Gaels finished heir non-conference slate 9-3. Scott Machado scored 17 in the William & Mary game. Junior Alejo Rodriquez added 12 points and 8 boards. Iona finishes up in control their seeding destiny . The Gaels visit Fairfield (tied for second) and St.Peter’s (a game behind Fairfield and Iona). Loyola – Dropped a heartbreaker on Senior Day as New Hampshire hit a shot with 0.7 seconds remaining for a 61-60 decision. Senior forward Jawan Wright continued his fine play of late with his third straight double figure outing with 10 points. Junior guard Jamal Barney returned after a six game absence and scored 16 points. Greyhounds entertain Canisius and Manhattan and already know they have drawn the Jaspers in next week’s MAAC tournament in Albany. Manhattan – Split the week losing to Fairfield and defeating Towson in the BracketBuster. Junior guard Rico Pickett averaged 17.5 PPG, 4.0 RPG over the two game stretch. Manhattan opened the Towson game with a 20-0 run in arguably their best performance of the season. Senior forward Brandon Adams had a career high 18 points. Jaspers dished out 22 assists and shot 53% from the field in that win over Towson. Marist – Lone game was a 66-65 to UC Irvine in the BracketBusters. Marist is 2-3 in those BracketBuster games. Trip to California was a homecoming for freshman guard Devin Price and sophomore guard Mike Taylor. Price enjoyed the trip with a career high 18 points which included four three pointers. Freshman guard Candon Rusin scored 10 points and has double digits in five straight games. Niagara – Won their third straight and five of the last six, defeating Wisconsin-Milwaukee 85-79. Niagara has now won four straight BracketBuster games. Anthony Nelson scored 10 straight down the stretch to pull out the win at UMW. Nelson finished with 14 points, 9 assists and 8 rebounds while Tyrone Lewis buried six first half treys on the way to a 23 point performance. Rider – Dropped an overtime BracketBuster game at Hofstra. The game featured Charles Jenkins of Hofstra, last years’ MET Player of the Year, who scored 31 points. Rider countered with MAAC POY candidate Ryan Thompson with a career high 38 points, 6 assists and 6 rebounds. Thompson has come on strong down the stretch averaging 25.4 PPG the last seven games. Broncs have won five of those last seven and finish up at home hosting Siena and Canisius their last two regular season contests. St. Peter’s – Went 1-2 for the week but are still in a good position. Peacocks can finish as high as third and no lower than fifth depending on what happens the last two games. The lone victory was on the road where the Peacocks used a 19-4 second half run to stop the Greyhounds 69-61. In between were home losses to a surging Rider club and a BracketBuster against Buffalo. Wesley Jenkins and Nick Leon (outside) and Ryan Bacon (inside) continued their fine play for John Dunne’s club. Siena – Dropped a BracketBuster game of note at Butler 70-53. The 53 points were Siena’s lowest in a single game in over two years. Saints have lost have lost all four of their games to top 50 opponents. The contest with nationally ranked Butler was Siena’s last opportunity to put themselves into at large consideration for the NCAA tournament, should they fail to win the MAAC tournament. Clarence Jackson paced Siena, who led Butler 31-28 at the half, with 24 points. Ryan Rossiter has been the most consistent Saint the last two months averaging double figures in scoring (14.3) and rebounding (10.7).